Almost missing your first train of a trans-continental trip probably isn't the best way to start. In truth it was mostly my fault- for some reason I am just not capable of allowing enough time for these things. Of course it wouldn't have been so bad if the '10 minute' taxi drive that I had predicted had actually taken 10 minutes- I swear we hadn't seen traffic in downtown Manhattan until we had a train to catch! The elevator in the hostel hadn't helped either- you don't expect an eight floor descent to take almost ten minutes do you?- but it did. Due to maintenance only one elevator was in service and of course everyone wanted it. We were full by the seventh floor but that didn't stop us from pausing at every other floor for the doors to open and the incumbents to wave at waiting guests who could not board. 'Amtrak?' questioned the taxi driver, 'that's right over the other side of the station- you'll have to run!' I guess entering New York's Pennsylvania Station just 5 minutes before your train departure does have one advantage- you don't have to spend any more time than absolutely necessary in this ugly cavern beneath Madison Square Garden (though you also don't have time to pick up a New York Cheesecake for the train). We found the train (and we really did have to run for it) on track 34 and boarded with two minutes to spare. 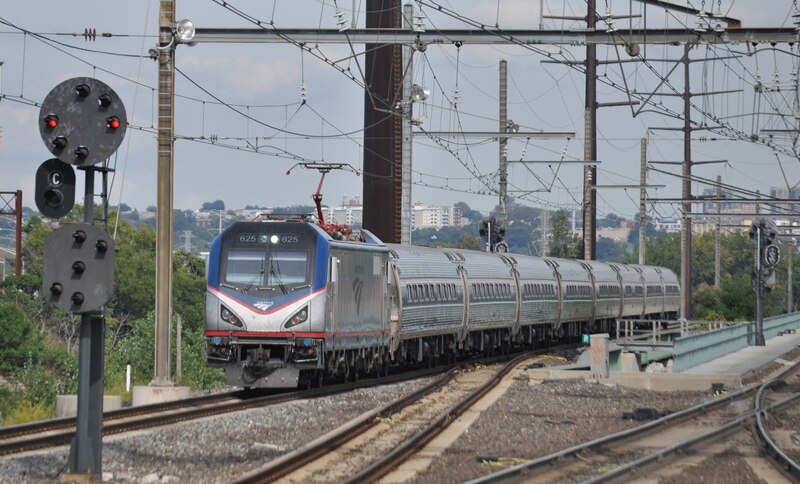 A similar train to ours, headed by an new ACS-64 locomotive with Amfleet or 'Amtube' coaches passes through the upper level at Secaucaus Junction just a few minutes after leaving New York's Penn Station. The Pennsylvanian left New York right on time and immediately dives under the Hudson River to emerge into New Jersey. We find some satisfactory seats and settle in for the journey. Seating is reserved on the train but only in so much as we are guaranteed a seat- which seat we chose to occupy is up to us. The train continues along Amtrak's busy North East Corridor until we approach what is undoubtedly the most important intermediate stop on the route at Philadelphia, where the train pauses for more than 30 minutes for an engine swap and reversal. The only electric loco we will experience this trip is promptly uncoupled and the train is briefly plunged into darkness. 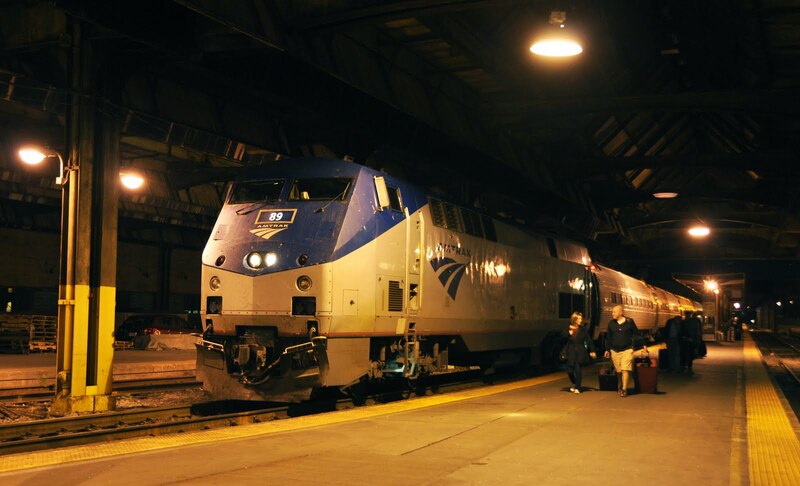 While the diesel engine which will work forward is attached there is time to head up from the dark platforms to the grand station hall, we are reminded however not to be late back to the train as it is the only departure today going east of Harrisburg. 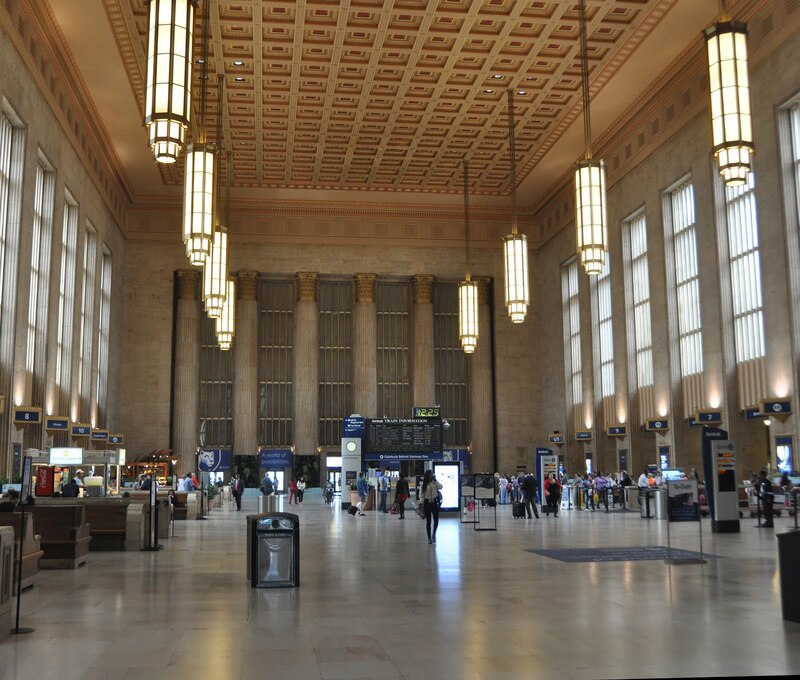 Philadelphia station is filled with a great array of eating establishments but seems to lack options to take food away to eat later. Feeling my diet in NY had been far from healthy I picked up a cup of fresh fruit and joined the re-boarders queue to get back onto the train. 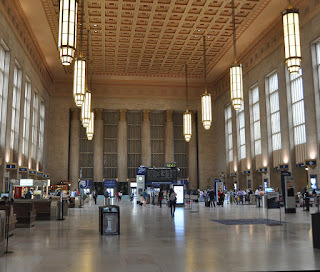 The grand station hall at Philadelphia. It is shortly after we resume our journey that we are forewarned of our first Amtrak delay. There is a broken down train in front of us and we may need to make an extra stop to pick up its passengers. We don't know how long the delay will be, or even if it will happen at all for certain but the conductor does stress that if it does, all available seats on the train will be required. Anyway, this is uncertain as of yet- what is certain is my hunger. The plan was to buy provisions back in at Penn Station in New York but of course there was no time for that. The on board cafe car would have to suffice. The smiley bar attendant was happy to serve me a microwave pizza (all the staff are so friendly on this train!) which I sit down to eat on the tables near the counter. We could gain snippets of the situation with the broken down train through listening to the calls on staff radios. Towards the end of the meal it was announced that we would indeed be rescuing the stricken train and would be delayed as a result. 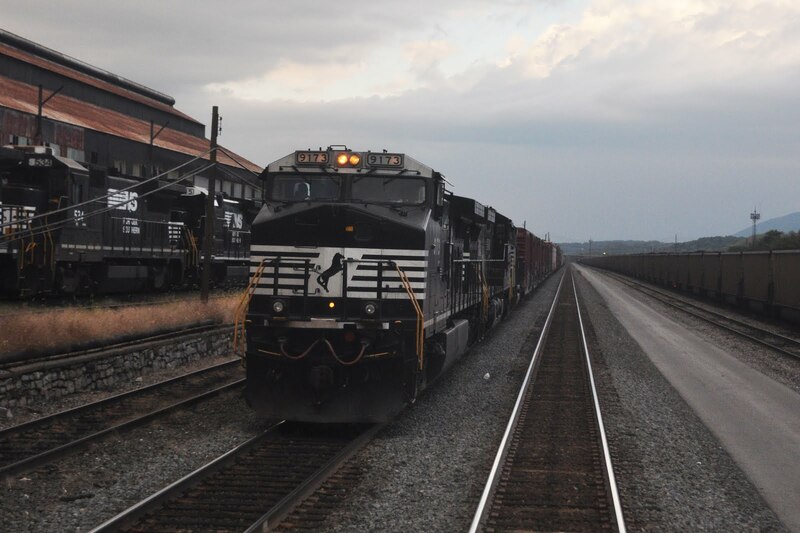 We would then be further delayed as we would now be calling at all the local stations to Harrisburg. We return from the cafe to our original seats to await the influx of passengers- and the delay. The delay and drama of the broken down train turns out to be somewhat less exciting than we perhaps might have anticipated- no pushing of the failed train and no passengers scrambling up on to the train from the tracks having been stranded in the back of beyond. The conductors estimate of over 100 people joining our train however is not far wrong and while everyone who has been waiting 2 1/2 hours does get a seat it is certainly now busier on board. Long Norfolk Southern freight trains dominate this route. We woke to sunshine in New York but as the day has gone on and we have headed west through Pennsylvania the weather has deteriorated and by Harrisburg it is raining heavily. The scenery however has been interesting with a green undulating landscape and a river which we have followed for much of the journey. I am often struck by how unfamiliar Amtrak passengers seem to be with the most basic principals of taking a train ride- getting on and off. There seems to be an attitude that the train will wait for them no matter how long they fancy taking to finish their coffee, pick up their bags and make their way to the door. After about four 'Final call's' for Harrisburg we eventually get back on the move, now minus the extra guests who's train was due to terminate here. I would love to see how these people would get on in a country like Japan; 'We will shortly be making a brief stop at Shin Osaka. '- miss that announcement and the 30 second stop and you'll be missing your destination! Arrival in Pittsburgh with Amtrak P42-DC 89 in charge.